What Can We Expect For Daniel Craig’s Dinner Jacket in Bond 25? Last week, Daniel Craig celebrated his 50th birthday. With production of his fifth James Bond film approaching in less than a year, it is fun to speculate what his fifth dinner jacket may be. 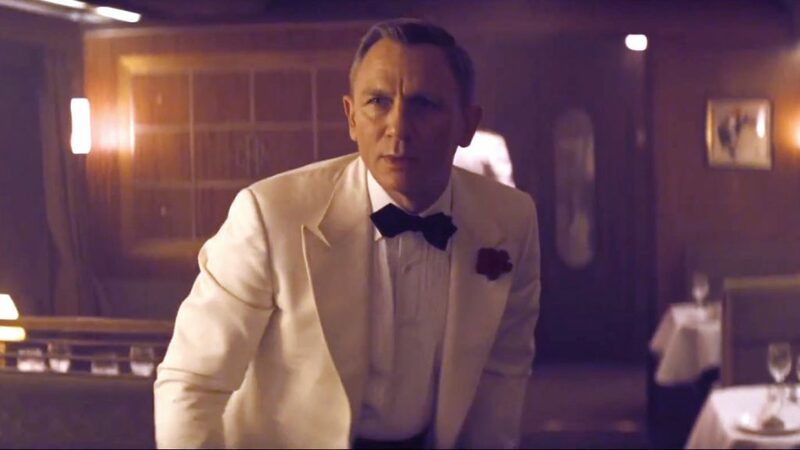 The last time James Bond did not don his iconic dinner jacket in a film was in the 8th Bond film Live and Let Die, so it is almost certain he will attend a black tie function in the 25th James Bond film. Fashion goes in cycles, especially for James Bond, so this may help us predict what Bond will wear next. After the dark blue Tuxedo, I said to Sam [Mendes], ‘forget it, I cannot design another Tuxedo because that Tuxedo was so perfect.’ So the idea of having to design another Tuxedo better than that one, I just didn’t know how. So I said, let’s go in a complete different chapter. Let’s go into a white one. 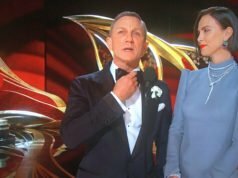 If Temime returns as costume designer for the next Bond film (which is likely considering he continued relationship with Bond producer Barbara Broccoli on her non-Bond film last year Film Stars Don’t Die in Liverpool), she will likely want to take yet a another approach for Bond’s black tie her third time around. It likely will not be a midnight blue shawl collar dinner jacket or an ivory peaked lapel dinner jacket like she did before. It is unlikely the ivory dinner jacket will reappear anytime soon regardless. Sean Connery, Roger Moore and Piece Brosnan often wear similar dinner jackets between their films. Of Connery’s eight different dinner jackets, there are three repeating styles: midnight blue shawl collar, black notched lapel or ivory peaked lapel. Moore’s dinner jackets are mostly variations on a theme as well, double-breasted peaked lapel or single-breasted notched lapel. Pierce Brosnan wears a single-breasted peaked lapel dinner jacket in each of his four Bond films, with the first in black and the rest in midnight blue. Daniel Craig has repeated the midnight blue shawl collar dinner jacket in two films, but he has worn three very different styles in four films. One style we are unlikely to see on Bond again is the notched-lapel dinner jacket. Despite this being the most popular style of dinner jacket, it is generally considered to be at best pedestrian and at worst an inappropriate and unsophisticated style of dinner jacket. Popular wisdom today states that notched lapels are incorrect on a dinner jacket and are a cost-saving measure so that a dinner jacket can use the same pattern as an ordinary suit jacket. And because dinner jackets hold a more formal place in society than they formerly did, they need fancier lapels to set them apart from ordinary suits. Notched-lapel dinner jackets, however, have been around since the early days of the dinner jacket. James Bond started wearing the style in Goldfinger, and it was a staple of Roger Moore’s and Timothy Dalton’s Bond wardrobes in the 1980s. But because of the notched-lapel dinner jacket’s current status with menswear experts, it is unlikely we will see Bond in it again soon. It is possible we could see the double-breasted dinner jacket return, especially if the costume designer is set on making another unique and iconic piece. Roger Moore brought the style to James Bond in his 1970s Bond films and brought it back for his last Bond film, A View to a Kill, in 1985. Timothy Dalton briefly wears it at the end of The Living Daylights, but Bond has not donned it since. With double-breasted jackets making more and more appearances in current fashions, it may be time for them to return to the Bond series. Daniel Craig himself is a fan of the double-breasted cut, and he wore a navy chalk stripe double-breasted suit from Brunello Cucinelli for a photocall in Rome during the filming of Spectre. If Tom Ford is still the clothier for Bond 25, the double-breasted dinner jacket could very well return because it has long been a speciality of theirs and is the preferred dinner jacket of Tom Ford himself. At the Academy Awards in 2007, Daniel Craig wore a double-breasted dinner jacket from Dunhill, and it looked perfect on him. It is a common misconception that double-breasted jackets are not flattering on shorter men, and it’s a misconception that should not get in the way of the style’s return. If Daniel Craig looks short, it’s only because he is standing next to taller people. Proportions and execution, rather than the overall style, are key to a flattering look. Some may bring up the shoulder holster as a reason against the double-breasted dinner jacket. 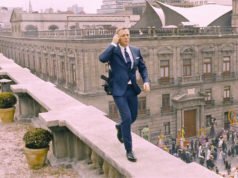 Though James Bond usually carries his Walter PPK in a shoulder holster, shoulder holsters do not provide as easy access with a double-breasted jacket as they do with a single-breasted jacket. But Bond also wears inside the waistband holsters in the recent films, which work just as well with a double-breasted jacket as they do with a single-breasted jacket, so long as the jacket has vents. Now that Craig is the first actor since Roger Moore to be playing James Bond at over 50 years old, the more mature double-breasted dinner jacket is a fitting look for someone his age. But with younger people wearing double-breasted suits again, there should not be fear that Craig will look like a dinosaur in a double-breasted dinner jacket. And with Bond 25 being the first Bond film since Roger Moore’s passing, it would be a fitting tribute to Moore. 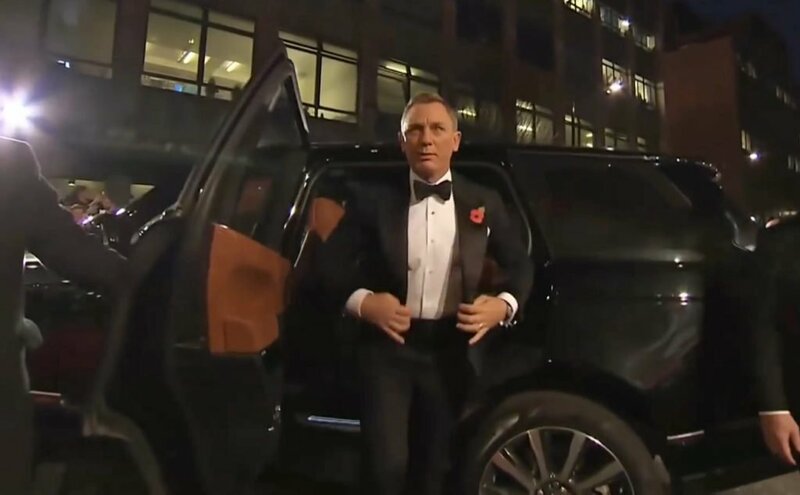 A double-breasted dinner jacket for Bond 25 would likely come in black or midnight blue with a button two, show three cut with peaked lapels. If the single-breasted dinner jacket returns, we will likely see peaked lapels on a black or midnight blue suit. The basic peaked-lapel dinner jacket that was a staple of the Brosnan years and made waves in Casino Royale has not returned since, so it is about time for its return. Jany Temime has not done this basic style yet, and if she returns as costume designer she may want to give her own take on this modern Bond staple. Daniel Craig wore a black mohair and wool blend single-breasted peaked-lapel dinner jacket for the Spectre premiere, and perhaps a suit similar to this one will appear in Bond 25. 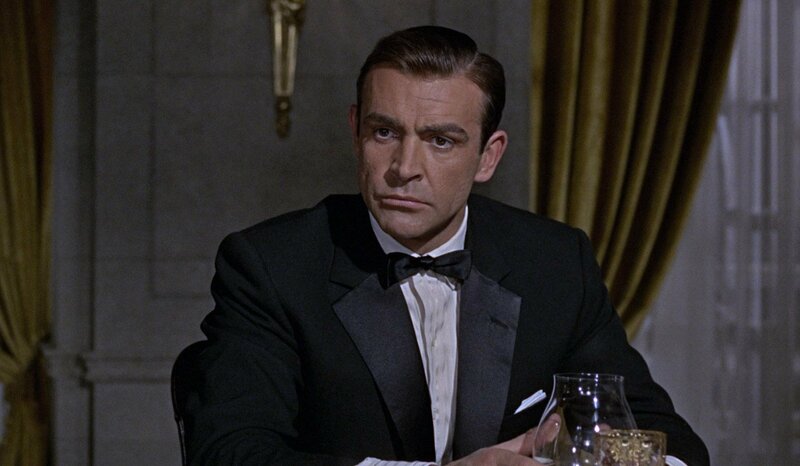 Bond has always worn more dinner jackets in midnight blue than black, but maybe black will return for a change. On the other hand, Jany Temime loves blue on Craig because it brings out his blue eyes, so midnight blue is likely to return in a different form than it appeared in Skyfall. If a single-breasted dinner jacket returns along with Tom Ford, the cummerbund will likely return as well. The traditional butterfly bow tie will also likely make an appearance again after the less common diamond-point and batwing bow ties featured in the last three films. The classic Bond dress shirt (Tuxedo shirt) with pleats and exposed buttons returned in Spectre, and perhaps that model will return again. Spectre was the first time since The Living Daylights that Bond wears a dress shirt with exposed buttons, which is the traditional fastening for the soft, pleated shirt and what Bond wears throughout the first 15 films. As black tie has increased in formality, black tie experts have considered studs and fly fronts the most proper styles for dress shirts, whilst buttons are too functional or ordinary. The fly front dress shirt is still trendy, and because it hasn’t been seen on Bond since Casino Royale it may be time for its return. What kind of dinner jacket do you think we will see or want to see in Bond 25? 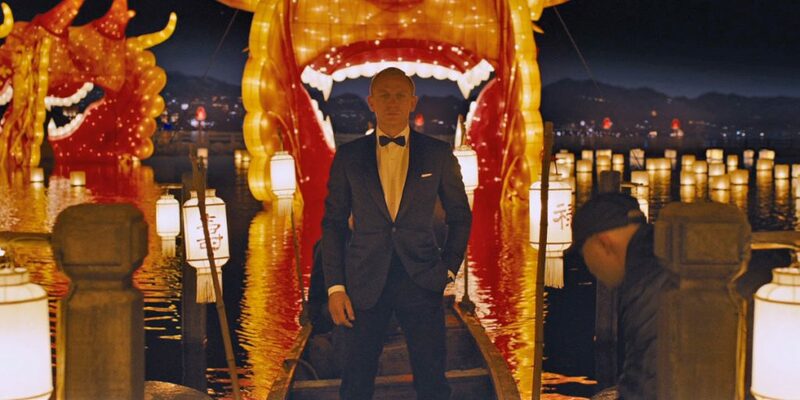 Could we see multiple dinner jackets in a Bond film again? Leave a comment below. 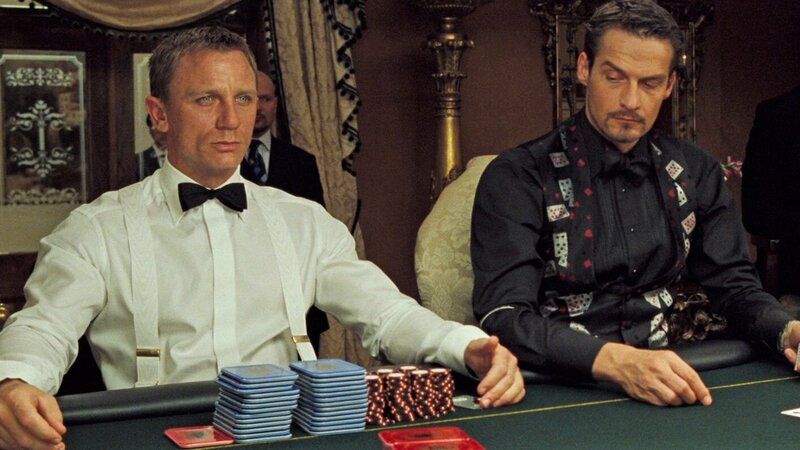 It would be fine if Bond 25 would give Bond the opportunity of wearing two different dinner jackets. I would very much appreciate the return of the ivory dinner jacket – but this time correctly with only one button on the jacket. And as to the other one – in any case it should be midnight blue, not black. I think a single-breasted jacket works best on Craig, but I wouldn’t be dissappointed if the costume designer (hopefully NOT Jane Temime!) came up with a double-breasted one. Perhaps he should go for a colourful velvet Brunello Cucinelli number like Daniel Kaluuya did at the oscar’s last night? HOPEFULLY WHOEVER IS THE COSTUME DESIGNER WILL PROVIDE CLOTHES THAT ACTUALLY FIT. I believe you left the caps lock button on. Additionally, the tight fit was mostly at Daniel Craig’s behest. He, unfortunately, seems to prefer his tailored clothing this way outside of acting. LEAVE THE CAPS ON IF THAT’S THE WAY YOU FEEL. I FELT THAT WAY WHEN THEY GOT RID OF BROSNAN ! -As a matter of fact, we don’t know any details about the process of designing Bond’s clothes and about the amount of Craig’s influence. He may have given some input, but if I he thought “Yes, that is exactly what I had in mind” after having received his Bond wardrobe is a different question. To me it’s first and foremost Temime who is responsible for those miserably-cut suits she provided Craig with. We know plenty of details about the process of designing Bond’s clothes thanks to an interview that The Bond Experience did with with Jany Temime. The 4×1 button configuration would be ideal for bond to have access to his PPK, while still being a fitting tribute to Roger Moore. 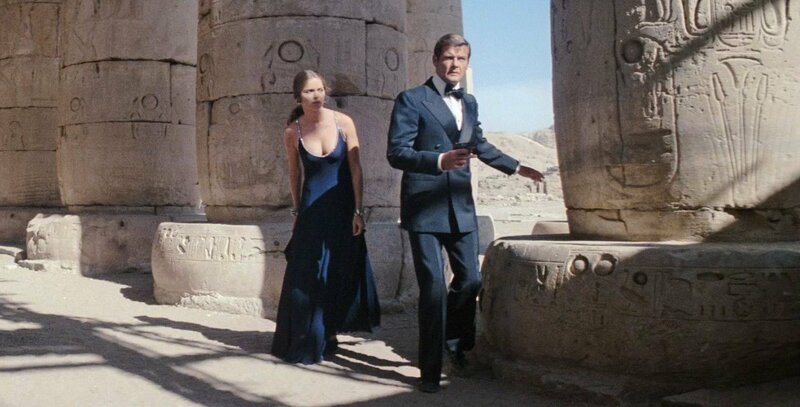 I would love to see a double breasted dinner jacket like Roger Moore’s in TSWLM. If Ford provides the tailored clothing and Temime goes double breasted, then I think we might even get this. What about the next fit ? I doubt Craig is able to obtain the same level of fitness that he has reached in the past. This might actually benefit his tailoring, as the desire to show him in skin-right garments will likely be diminished. Reaching 50 does that! I don’t know if it’s intentional or not, but he has a noticeable paunch in Logan Lucky. The last time he let himself go on purpose was in The Girl With the Dragon Tattoo. I hope it will be a double breasted dinner jacket. A fitting tribute to Roger Moore. A dinner suit in midnight blue or black. Another welcome return would be a classic navy blazer with gray or charcoal trousers. Sadly, I think the latter is less likely! The navy blazer, especially with metal buttons, is seen as stodgy or “old” now by most people. Metal buttons are associated with “preppy” American style, but blue blazers with corozo or horn buttons are at the height of popularity at the moment. The suits are required less and less, so, instead, many men wear blue blazers with odd trousers, brown loafers, and often skip the tie. This could be an ideal option for Bond to wear a blazer in a fashionable way. I myself do not use brass buttons. I have dark gunmetal buttons and brown horn. The brown horn buttons can be a nice touch making it a modern and give it a nod from the past. With the very modern cut Craig wears I think he can pull it off. If only Matt could dress Bond. Tom Ford makes a rather nicely cut double breasted, but it is seldom seen so I imagine they are only available MTM. I wouldn’t mind that. 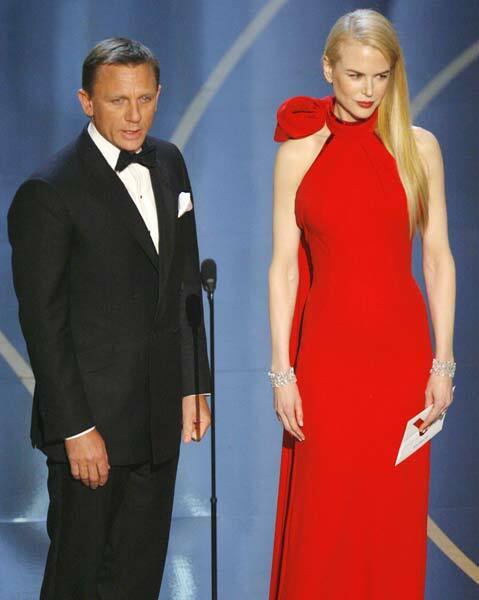 But a midnight blue, single button peak lapel — which hasn’t been worn by Bond in 16 years!!! — would also be quite welcome. Just, please, let it have double vents this time. …or no vents at all (which is standard for dinner jackets and preferable to any kind of vent IMO). It’s standard, yes. However, double vents have been considered acceptable, if not as formal, for the better part of half a century now. I think they’re also necessary for a man of action like Bond, especially if he keeps wearing a small-of-back holster. This lady sure doesn’t do modesty! The fact that she deemed the Skyfall dinner suit “perfect” speaks volumes and none of them worth the least attention! I found it a little better fitting than the suits in the movie. I just wonder why she insisted on a centre vent when all other details were traditional. A double breasted lounge suit too,could be nice. I agree, but considering the Kingsman movies just recently had spies in double breasted suits they may not find the comparisons favourable! We can expect that this will be his last dinner jacket we will see on him as james bond. He needs to go. To me, he never was bond and never will be. Cool. Do you have anything constructive to add? Mr.Spaiser is giving the lecture. This blog is about Bond’s clothes, and not about the Bond actors, their way of performing the role and “Who-is-my-favourite-Bond actor?”. This blog is more than just abut a garment. Come on, you know better than that. Actually, this blog is primarily focused on clothes. The actor is of far less importance here, though some Bond actors like Moore and Craig had some input into the clothes they wear as Bond. That’s part of what I was referring to. The mind set of choosing something along the foundation of bond has been the most important part. For example, although brosnan is my favorite, I would not wear the Hawaiian shirt, however i do choose my clothing with bond in mind. Just because he wore it doesn’t mean it would look good on me, however I maybe able to choose something that (with a little luck) would be in the spirit of bond. P.s. I won’t be buying a mustard yellow suit or a four button suit anytime soon. P.s.s. speaking about input dalton as well had input when the costume designer of LTK wanted to put bond in pastels to follow the line of Miami vice, and dalton refused. That, and the scene that was cut from the same film of dalton wearing a giligan hat. I’ll cast my vote for a classic double-breasted tuxedo much like Tom Ford wears himself, since it’s a style we haven’t seen on Bond in quite some time and seems like a good place for Temime to go to make this one stand out from her prior two films. Tom Hanks wore a double-breasted shawl-collar tuxedo to the Academy Awards a few years ago that I believe was a Tom Ford example. Bond has never worn this style before, it could be an interesting new direction for him. A double breasted shawl collar, while unarguably classic, may look old and stodgy to audiences regardless of the age of the actor portraying Bond and regardless of the fashion designer creating it. Not as rakish as peak lapels. To make a long story short, the style suits Tom Hanks (as does Hanks’ other tailored clothing from Ford) but may not suit the character of James Bond in the eyes of the public. I do, however, think the 4×1 with peak lapels would be a little more readily accepted. My guess: Either they go for a not so outstanding Dinner Jacket (like in Casino Royal), i.e. black peak lapels or shawl collar. Or they decid for something fancy but classic: Double breasted midnight blue. (well maybe a bit too tight…) – Thats my bet. « This blog is about Bond’s clothes, and not about the Bond actors, their way of performing the role and “Who-is-my-favourite-Bond actor?”. Yes, but close enough, as we aim to celebrate tailoring excellence, and thus also those whose contribute to it. Just as « manners maketh man », it is « the man who makes the style ». Some did it, naturally, some struggled. You won’t be surprised in my statement that Craig sadly belong to the latter. Thanks for that. Once again this contributes nothing to the topic of Bond’s next dinner jacket. Is it really necessary to drag that into the argument again? It’s of no use because EVERYBODY who regularly comments here knows how certain contributors think of certain Bond actors. Don’t you think that by now it’s become a bit repetitious? -Exactly – and do you consider permanent befouling of an actor as a sign of good education? I know that it wasn’t you who re-started that tedious thing again, but I am bit surprised and a bit disappointed by your joining it. « the man who makes the style ».Some did it, naturally, some struggled. -Right, and Craig certainly belongs to those who did it. In QoS (and also partly in CR) he looks very smart in his suits. But in QoS they really merited to be called “suits”; they were not that I-don’t-know-how-to-call-it he is wearing in SF and SPECTRE. Craig displays a very virile charisma, like Connery did. Not the slightest trace of being (in a silly way) blasé, but a lot of self-confidence, perhaps sometimes mixed with a bit of arrogance, but – he is James Bond, so what? There were others who struggled and never came close to what James Bond is and what he should be. I as well would like to see a (preferably with a not so high button stance) double breasted dinner jacket. A 4*1 DB could be very nice. He could certainly wears his usual braces with it. And why not a classic T&A shirt with pleated front like the TF one he wore in QOS. The Dunhill dinner jacket Craig was wearing looks stunning although he would look even better in wider peaked lapels I think. Actually, I did work at Dunhill a bit and their clothing would be perfect for Bond. Stylish, classically British in the cloths with a modern cut, and a bit less showy than Tom Ford dramatics cuts and luxurious fabrics. Really, it’s nice stuff ! I still think Craig looks better dressed at formal events and premieres (judging by your pictures) than he was wearing black tie in his last two movies. NB : clearly a double-breasted shawl collared DJ would be too much dandyish for him. I can’t see any Bond actor wearing one, or perhaps Roger Moore. It would be an item better suited to debonair allies like Draco or flamboyant villains like Largo. Interestingly, both Italian actors and characters ! PS: Stan, thank you for a great demonstration. FWIW, Fleming did wear a shawl color double breasted dinner jacket. Dunhill would be a nice brand to use, but EON is so entrenched in using Ford at this point because of the benefits of their arrangement (free publicity in exchange for providing free clothing) that it may not ever happen. As said in Matt’s interview with James Cook, Turnbull & Asser does not compensate goods anymore, which is perhaps why they parted ways with EON after Lindy Hemming. Dunhill may not be willing to honour the same terms as with Tom Ford either. I agree with you about the shawl collar double breasted. It may look too stodgy for a lot of audiences as well, who are expecting Daniel Craig (even at 50) to be wearing slightly younger styles. It also just may not look rakish enough for the character in general. I’d say velvet may be a possibility, not only as reference to Connery’s aging Bond in Diamonds Are Forever but also part of the current Bond trend of ‘borrowing’ from other franchises, in this instance the Kingsman and their smoking jacket. I think velvet would be a very classy choice for the next bond film, but I don’t think you’re giving them enough credit. They’re not borrowing ideas from other franchises. They may have the general atmosphere of the Bourne films, or the team structure of Mission Impossible, but Bond is still Bond. I am not befouling the actor, just stressing out the inadequacy between his style and the character. But I am always open to any advice to improve the level of my education. It is your right to believe he dresses appropriately. -I have no intention whatsoever in that direction. And please read carefully – my remark did not aim at you personally. And as to Craig: “he dresses”, “his style” – it’s rather that he IS dressed by and in the costume designer’s (=Temime’s) style, which, as far as suits are concerned, is horrid. And I have stated quite clearly that IMO the SF and SPECTRE suits are not appropriate for Bond. But undoubtedly, Craig as Bond would look smart in his suits, as smart as any of the other Bond actors did, had he only the right costume designer at his side, i.e. someone like Louise Frogley who knows how to dress somebody in good taste. A double breasted dinner suit would be a great tribute to Sir Roger Moore. It is also a style that is becoming trendy. A navy velvet smoking jacket may work in the right setting. The baggy trend is back (for now). Hope it doesn’t impact the fit. My vote also goes for a black double-breasted or very dark midnight blue. If it impacts the fit insofar as the suits look more like TWINE than Skyfall, then I’m all for it. But I doubt there is any chance we ever see Craig’s Bond in anything that roomy because he exerts influence over the costumes and he doesn’t favor that style in his personal wardrobe, despite it becoming trendy again over the last couple of years. IMO for Craig the QoS suits should be the template to go for. In comparison to the SF and SPECTRE suits, the QoS ones could be considered “roomy”. But by all means they should avoid going back to the “Brioni days”, because on the whole the Brioni cut never suited Craig very well. Curious where you’re seeing this trend. I can barely find anything that fits my shoulders or hips now off the rack unless I’m willing to give up next month’s rent (spoiler alert: I’m not). I wish the fit of the 2000s was still in vogue. I take no personal offence, and am immune yet open to any remark and criticism. Especially those that aim at increasing my knowledge in all matters sartorial. Temime is a real oddity, but certainly not the first odd choice of the current producers.. The trouble (or rather one of the troubles) with Craig is his undoubtably alleged involvement in the sartorial choice. If someone can prove me totally wrong, so be it. In CR, there were a few acceptable pieces. But rather quickly eclipsed by: the horrid suit he wears when landing in Nassau, the short sleeves, the open neck shirt with his DJ at the dinner with Vesper and even the 3 piece suit at the end. Let us be honest: whatever the efforts, and the price of a Brioni, it simply does not suit him. A forced elegance equals a massive lack of elegance. -Spot on. I think using the same costume designer for two subsequent films is enough. Now they should move on to another one – there is a need for a breath of fresh air. He also looks quite fine in his black tie ensemble from the SPECTRE premiere. But I really would like to see him in true bespoke suits. The Tom Ford stuff is not bad, but for my taste it is a bit too much middle-of-the-road. In any case no substitute for bespoke. I don’t care who made the suit, bespoke is second to none. End of discussion on that. So if notched lapels are out of favor, do you think they should still be worn at small dinner parties? If not, would you recommend a shawl lapel? I would recommend a shawl collar over notched lapels. I would say the current front-runner would be a black double-breasted dinner jacket. However, it would be interesting to see what situation that would be suitable in. If rumours are true, then Craig’s Bond will be on a vengeance mission (again) and may be looking for help outside of the service. This could give him a perfect excuse to meet with rich and powerful connections to have dinner at an exclusive London Gentleman’s club which adheres to a strict dress code. To go a bit out there, I think that we may see Craig’s Bond bring other modern fashion tastes into the mix this time around. I think the wildcard could go to a version of the Dinner Jacket Daniel Craig wore to the Skyfall premiere; perhaps slightly darker and in velvet? Yes, it may draw comparisons to Colin Firth’s Kingsman smoking jacket, but at this point anything in velvet or double-breasted will inevitably draw that conclusion from the public. Sadly since Temime has been dressing him, Bond’s have been the former. Single vents and two buttons are unfortunate. Loved reading your theories on this. A peak lapel a la the SKYFALL premiere would be great! I’d also love to see the double breasted look. I wonder – do you have an email list, or is there a place I can sign up for notifications on new posts? I do not have an email list, but you can follow The Suits of James Bond on Facebook or Twitter for updates. While I know that double breasted jackets being unflattering on shorter men is a false statement and misconception, I was told by some people that double breasted jackets are better of for older people and double breasted jackets can make a young man old. What do you think Matt? I’d love to know your opinion. Double-breasted jackets don’t make a man look older, unless you associate the style with okder men. The style is currently fashionable with younger men, so that’s why I think it can be a good choice now. Thanks Matt for your opinion, it gives me confidence to actually try a double breasted jacket. Thank you once again Matt. Who told you that lie? I’m wearing a double breasted suit now and have never gotten comments to that effect. Probably. Though it may help my suit is a relatively modern (not tight) fit. I agree with you both Jovan and Dan, I wonder why people these days dress too comfortably instead of dressing there best. I maybe young but I love collecting and wearing suits, blazers and odd jackets in various cloths and don’t find them very old-mannish. I especially love wearing my blazer anytime.